A collection of portraits of members of the mercantile and banking dynasty founded by Jakob Fugger (circa 1430-1518), each portrait accompanied by appropriate heraldic insignia, and displayed within an architectural or grotesque frame of impressive quality and size (platemarks 340 × 230 mm). On the versos of the portraits are printed brief genealogical notices apparently supplied by Marcus Henning (1561-circa 1622). The book has been long recognised as a valuable document for the history of costume, especially for women's clothing. Indeed, its most striking feature is the high proportion of women portrayed: nearly half of the portraits in this edition (sixty-two of 127) depict women, the wives and daughters of the Fuggers in nearly equal number. Fuggerorum et Fuggerarum, quae in familia natae, quaève in familiam tran­sierunt, quot extant aere expressae imagines. provenance H.P. Kraus Inc., collation note dated November 1990 on lower pastedown. Short tears in margins of eight folios neatly repaired (two extend just within the platemarks), otherwise a fine copy with the engravings in excellent impressions. binding contemporary vellum drawn over paper boards. After Custos’s death (1616 or 1617), Lukas and Wolfgang Kilian brought the work up-to-date, adding to the end of the series portraits of Margareta Fugger-Caretto (1592–1652) and other members of the family who had been born (or reached maturity) since 1593, and interpolating portraits of Ulrich Fugger (1441–1510), Sigmund Friedrich Fugger (1542–1600), and others of whom models had just become available. Altogether, the new edition presents 127 portraits. 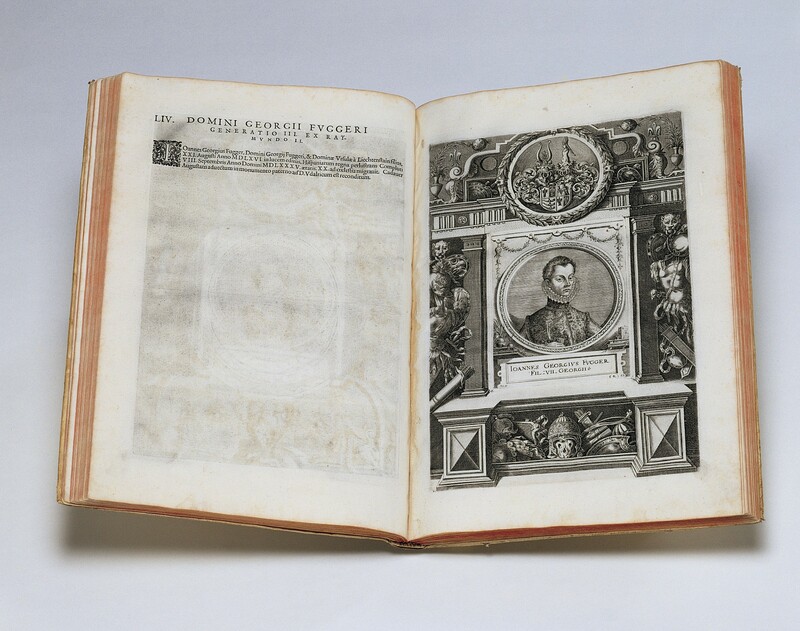 Sixty-two portraits, eleven designs of frames, and the alle­gorical title-page, are printed from plates attributable to Custos. Lukas, the more talented of Dominicus’ stepsons, engraved twenty-nine portraits and one new frame; his younger brother, Wolfgang, contributed thirty-six por­traits, three frames, and the large print of the Fugger coat-of-arms placed at the beginning of the volume.7 A local draughtsman, Johann Mathias Kager (1575–1634), city painter of Augsburg after 1615, was designer of the four frames engraved by the two Kilians.8 Unlike the 1593 edition, which seems to have been limited and distributed by the family, the 1618 edi­tion was a commercial undertaking by the newly-established publisher Andreas Aperger. Many of Custos’s matrices (both portraits and frames) were extensively reworked by Lukas and Wolfgang Kilian for the new edition. Backgrounds were strengthened with cross-hatching and shading, and the portraits occasionally were updated.9 The original portrait of Raymund Fugger (1489–1535), for example, depicts him as a young man (1593 edition, pl. 8); the Kilians added a beard to convey the appearance of old age (1618, pl. 8).10 Hans Jakob Fugger (1516–1575) likewise was transformed from a middle-aged (1593, pl. 12) to an old man (1618, pl. 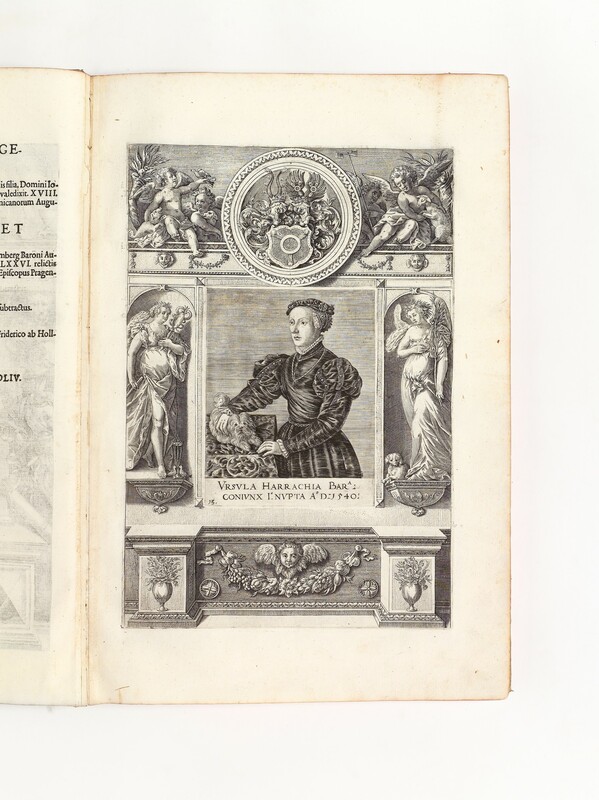 12).11 Custos’s portrait of Helena Fugger-Madruzzo (1593, pl. 59), who had married Georg Fugger (1560–1634) in 1583 and by 1611 borne him twenty-one children, was replaced by an entirely new portrait engraved by Wolfgang Kilian, which depicts her in old age (1618, pl. 86). Custos’s portrait of the celebrated entrepreneur Hans Fugger (1531–1598) also was replaced by a new one, en­graved by Lukas Kilian, a close copy except in one detail: in the original, the subject is depicted with a notebook in his right hand (1593, pl. 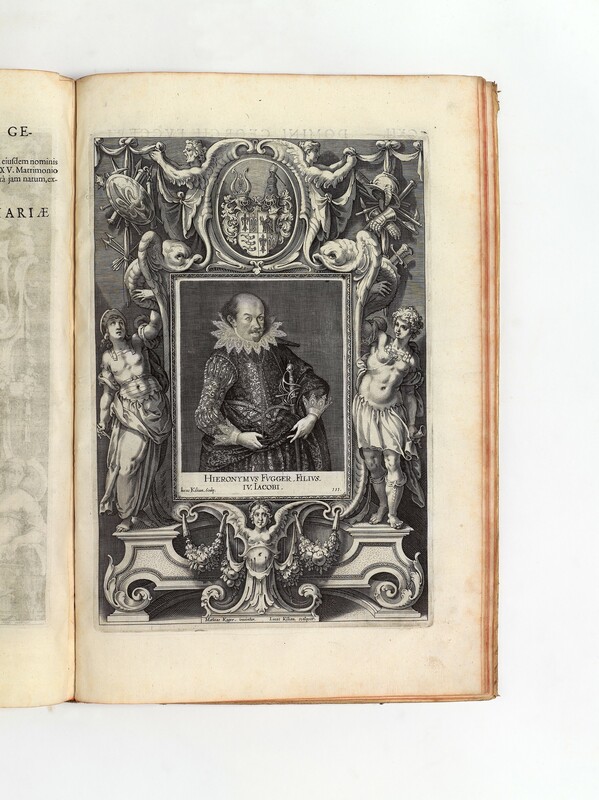 23); in the substitute, the book rests on the table top (1618, pl. 74). 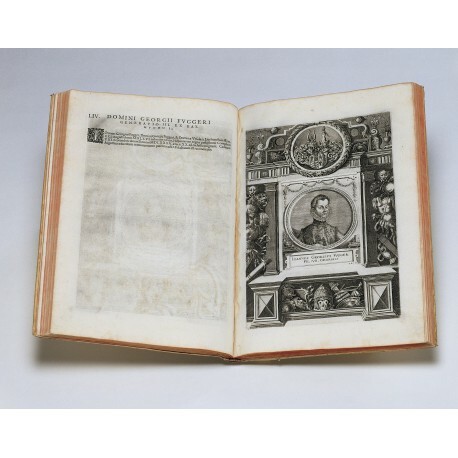 The matrices of the portraits were restruck (without the engraved frames) at Augsburg in 1620 for an edition with German text, published by Sara Mang, under the title Contrafahe der Herren Fugger und Frawen Fuggerinnen. 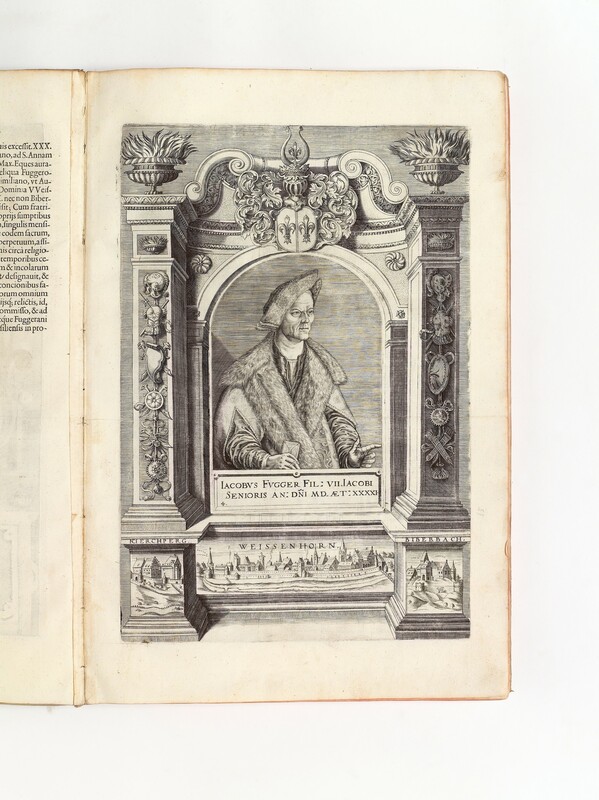 Another edition, also without the engraved frames, but restituting to the series the portraits of Anna Jacobäa and Barbara Fugger, and others, was printed at Ulm in 1754, as Pinacotheca Fuggerorum. 1. This cancel appears also in a British Library, shelfmark 604 l.15. 2. Walter Dietl, Die Elogien der Ambraser Fürstenbildnisse (Innsbruck 2000), pp.66, 81. 3. Fugger und Welser: oberdeutsche Wirtschaft Politik und Kultur im Spiegel zweier Geschlechter, catalogue of an exhibition held in the Schaezlerhaus, Augsburg, June–September 1950, Städtische Kunstsammlungen (Augsburg 1950), no. 389; Augsburger Barock, catalogue of an exhi­bition held in the Rathaus and Holbeinhaus, 15 June–13 October 1968 (Augsburg 1968), no. 657; Welt im Umbruch: Augsburg zwischen Renaissance und Barock, catalogue of an exhibition held in the Rathaus and Zeug­haus, 28 June–28 September (Augsburg 1980), no. 372; Die Fugger im Bild: Selbstdarstellung einer Familiendy­nastie der Renaissance, catalogue of an exhibition held in the Bayerische Staatsbibliothek, 10 March–22 May 2010 (Lucerne 2010), pp.123–127, 182–185. 4. Georg Lill, Fuggerorum et Fuggerarum imagines (Augsburg 1938), i, p.v; Norbert Lieb, Octavian Secundus Fugger (1549–1600) und die Kunst (Tübingen 1980), p.91. 5. Die Fugger im Bild, op. cit., pp.116–117, 170–173. 6. Die Fugger im Bild, op. cit., pp.117–123, 178–181, discussing all four known copies. 7. The twenty-nine portraits signed by Lukas are nos.30, 38, 43, 55–56, 60, 62–64, 66–67, 69, 74, 87, 95, 101, 103, 107, 109–111, 113, 116–118, 120, 122, 124, 127; Wolfgang Kilian’s portraits are nos.2, 31, 34–37, 39–41, 50, 57–59, 61, 65, 68, 70–71, 86, 88–89, 91–92, 96–97, 99, 102, 108, 112, 114–115, 119, 121, 123, 125–126. 8. Susanne Netzer, Johann Matthias Kager: Stadtmaler von Augsburg (Munich 1980), p.134 no. D24; p.125 no. Z46; compare Hollstein, op. cit. (Blaricum 1986), xvb, p.169 no. 6 (wrongly crediting Kager with all the engraved frames). Cf. Die Fugger im Bild, op. cit., pp.186–187 (exhibiting one of Kager’s preparatory drawings). 9. These alterations to Custos’s matrices are not recorded in Hollstein, op. cit. (Amsterdam 1960), vi, p.183 no. 60. 10. Compare reproductions in Norbert Lieb, Die Fugger und die Kunst im Zeitalter der hohen Renais­sance (Munich 1958), p.55 and Abb.82–83. 11. See Die Fugger und die Musik: Anton Fugger zum 500. Geburtstag, catalogue of an exhibition held in the Fuggerhaus, Augsburg, 10 June–8 August 1993 (Augsburg 1993), pp.126–127 no. 8, reprodu­cing the earlier state of the print from ‘einer altkolorierten Prachtausgabe’ (in Fuggermuseum Babenhausen): ‘Blatt 12 der regulären Ausgabe von 1618 gibt ihn in derselben Aufmachung als älteren Mann wieder’. 12. Martha Schad, Die Frauen des Hauses Fugger von der Lilie 15.–17. Jahrhundert (Tübingen 1989), pp.111–113. 14. One portrait is of particular interest (1618, pl.46), as the sitter’s clothes have survived: Maria Jakobäa (1562–1588), daughter of Hans, Freiherr Fugger, Herr zu Kirchheim Glött Mickhausen Stettenfels und Schmiechen, married in 1579 Octavian Secundus, Freiherr Fugger, Herr zu Kirchberg. See Karen Stolleis, ‘Die Kleider der Maria Jakobäa Fugger (1562–1588)’ in Documenta textilia (1981), pp.357–370; Schad, op. cit., pp.44–47. 15. Schad, op. cit., pp.30–32. 16. Schad, op. cit., p.133 (print reproduced). 17. See Lill, op. cit., p.vi, on the originals from which some portraits were taken. The lost original of the print of Ursula von Harrach (reproduced Fig. 4) is generally considered to have been painted by Jakob Seisenegger; see Kurt Löcher, Jakob Seisenegger, Hofmaler Kaiser Ferdinands i (Munich 1962), p.88.